BEIJING • Up to half a million people were being moved from their homes in south-eastern China yesterday as the region braced itself for a "giant" typhoon that is expected to make landfall later in the week. Talim, the 18th typhoon for the year, was forecast to hit several cities along the central and northern sections of the Fujian coastline, including Fuzhou and Ningde, reported the South China Morning Post, citing Ms Liu Aiming, chief engineer at the province's meteorological bureau. Ms Liu said as many as 500,000 people would receive evacuation notices, though the exact figure was subject to change as the situation was evolving. She added that school buildings and sports stadiums were likely to be used as temporary shelters. Most of the people were being evacuated from properties that were unlikely to withstand the high winds, or in areas that were prone to flooding and mudslides, or were close to construction sites, where they could be hit by flying debris, the newspaper said. Talim is expected to hit the north and north-east parts of Taiwan the hardest today and into tomorrow with heavy rain and strong gusts. The storm will then move north-west at a speed of 25kmh to 30kmh towards the coast of Zhejiang and Fujian, making landfall tomorrow or early on Friday, Reuters, citing China's National Meteorological Centre, reported. 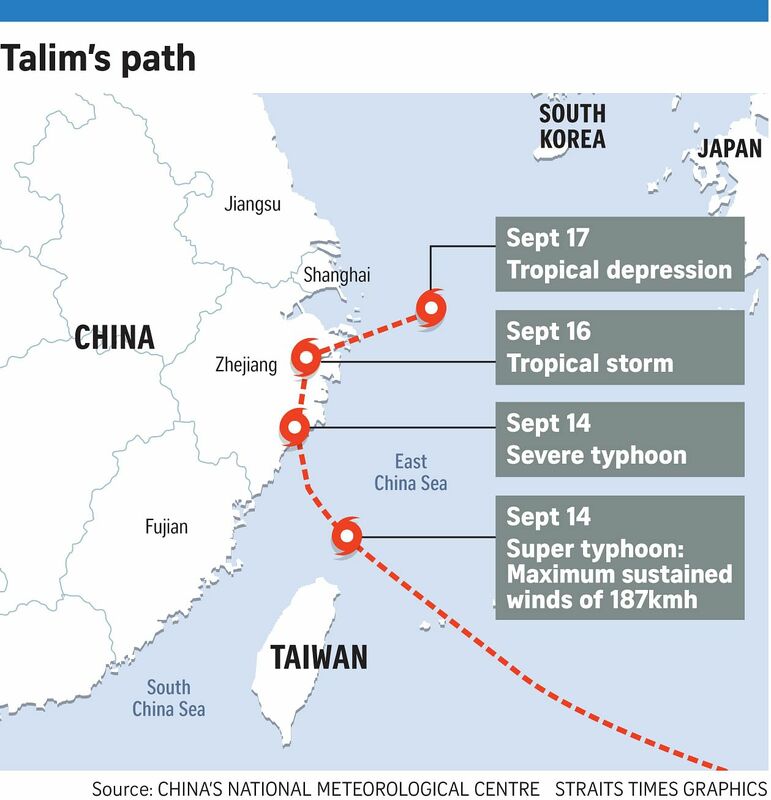 Talim was expected to bring gales to the southern East China Sea, the Taiwan Strait and waters east of Taiwan, as well as parts of the South China Sea. "Talim is a giant. It will dwarf any of the others (typhoons) we've seen this year," Ms Liu said. People who resisted orders to evacuate would be forced to do so by inspection teams, she added. The Fujian and Zhejiang governments initiated a Grade IV emergency response on Monday night, the lowest of a four-grade emergency response system, according to Reuters. The news agency said relevant government agencies were told to monitor Talim and take emergency measures in a timely manner, according to a statement on the official website of Fujian province. Talim is a giant. It will dwarf any of the others (typhoons) we've seen this year. MS LIU AIMING, chief engineer at Fujian's meteorological bureau. Late last month, Typhoon Hato pummelled Macau with winds of more than 200kmh and wreaked havoc in the nearby financial hub of Hong Kong.